Angel clouds remind us to take ourselves lightly. My daughter calls these angel clouds. They are a great reminder of a simple truth: when we rise above a problem we look at it with different eyes. Suddenly, we can see the big picture. We can actually see beauty where perhaps before we just saw stress and sadness. 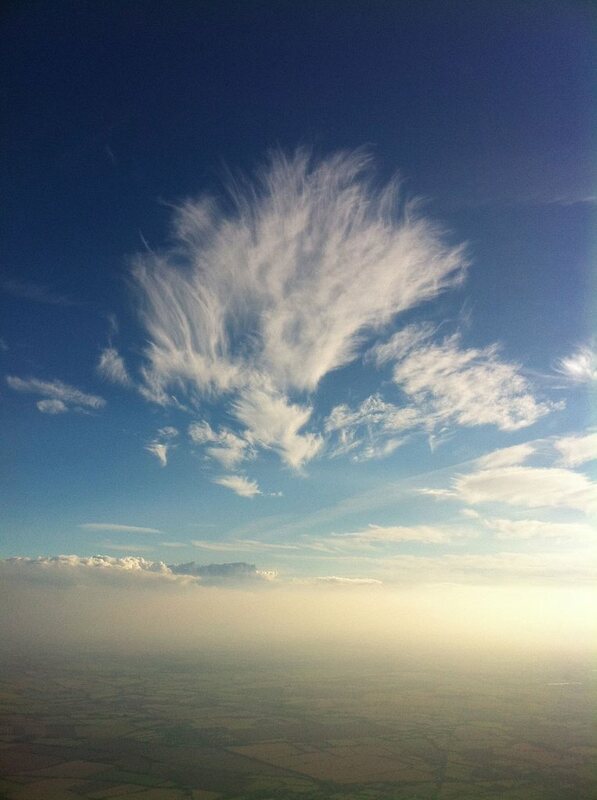 Look at this picture, taken last week over Southern England. Everything is beautiful if you look at it from a higher perspective. Wow that is definitely an Angel Cloud – absolutely beautiful. Thank you for sharing this Suzanne and for the uplifting words. Thank you Barbara. Makes me feel uplifted every time I look at it! I feel peaceful and calm when looking at your Angel cloud again and again. Soothing comes to mind too, as I float along with your beautiful cloud. Love, light and lots of warm hugs. Suzanne I have just read Steve Schwartzman’s site – really interesting. I particularly liked the “false purple pineapple” at the end. It is a beautiful vision. The first word that came to mind to describe the clouds is wispy. Thank you so much, Steve. I’m off to look at your site now – sounds lovely. A lovely image! It’s as you say, getting another (preferably higher) perspective can make all the difference. Thank you for your kind comments, Jen. Your book sounds wonderful. Do keep me posted about publication date. I’d like to spread the word about it.